Vitamin B6 also called Pyridoxine is a water soluble vitamin which is part of the B Vitamins group. It exists in 3 forms – pyridoxal, pyridoxamine and pyridoxine. All these are interchangeable in the body. Like all other B vitamins, Pyridoxine is also an essential nutrient which helps convert our food into fuel, providing your daily energy. • Help in the production of neurotransmitters which take care of smooth functioning of nervous system. • Contribute in the formation of red blood cells which in turn carry oxygen and nutrients to all parts of the body. • Aid in balance of blood sugar levels. • Promote normal functioning of immune system by assisting in production of antibodies. 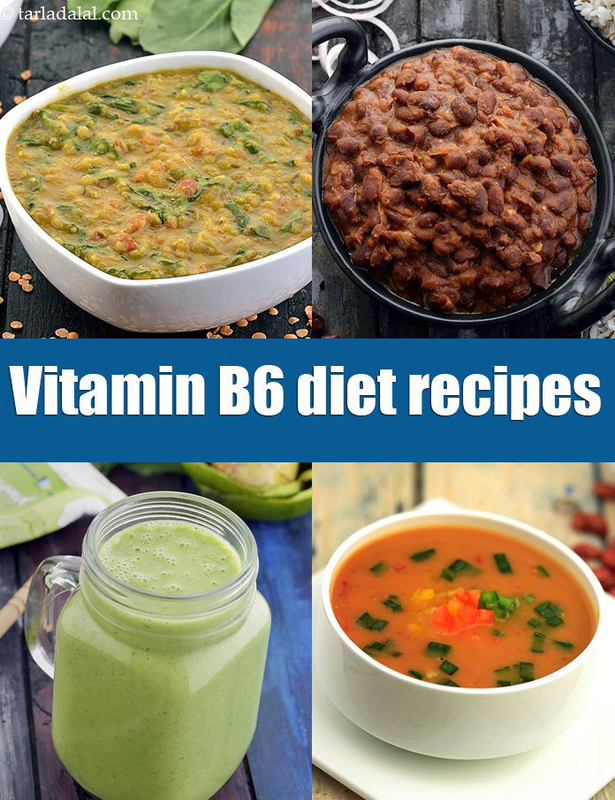 Although not very common, the deficiency of vitamin B6 has symptoms like cracked lips, fatigue, low immunity, anemia, mood swings, depression and other neurological symptoms. The toxicity of this vitamins isn’t very common too. It being a water soluble vitamin, the excess of this vitamin is flushed out in the urine. Learn with us how to cook healthy using these Pyridoxine rich ingredients. Banana and cucumber salad is a unique combo made up in kachumber style! sweet bananas and crunchy cucumbers are a very compatible twosome when prepared just right, with a texture boost from peanuts and coconut and a flavour boost from green chillies and lemon juice. Serve chilled. Rajma curry and rice… no meal can be more satiating. Rajma is filling and nutritious and turns out beautifully when cooked in a thick tomato pulp with only basic spices. This curry is a favourite in punjab and very popular amongst all age groups.